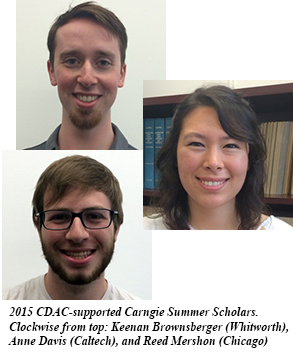 This summer, three Carnegie Summer Scholars are working on CDAC-related projects. Keenan Brownsberger (Whitworth University) will be studying the reaction of metals with hydrogen at high pressure and temperature with CDAC Research Scientist Muhtar Ahart. Anne Davis (California Institute of Technology) will be working with Carnegie Staff Scientist Tim Strobel on the synthesis and characterization of new potential solar energy materials using high pressure-high temperature methods. Reed Mershon (University of Chicago) will be working on understanding the partitioning of sulfur in the Earth’s core with Carnegie Postdoctoral Fellow Colin Jackson.